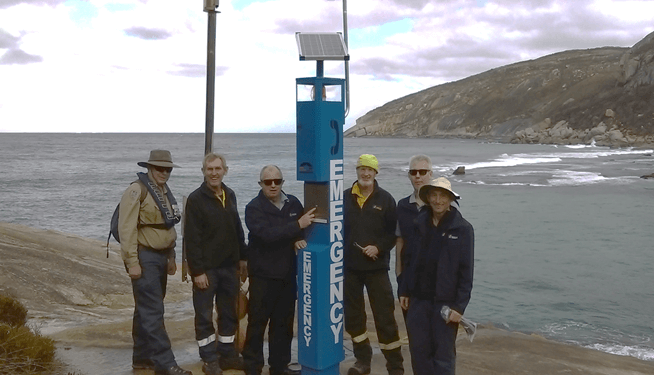 The Albany community recently received a boost for fishing safety, with the instalment of an emergency telephone at Albany’s notorious rock fishing location, Salmon Holes. The Minister for Housing, Racing and Gaming Colin Holt, received a recommendation from the Gaming Community Trust to fund and install an emergency telephone at the well-known high-risk fishing location. Recfishwest Chief Executive Officer Dr Andrew Rowland said the support from the Government to improve public safety should be commended and as the recipient of the grant, Recfishwest were more than happy to assist in delivering improved safety outcomes. “This telephone runs on a 3G network in a location with limited to no service. It will provide access to emergency services in a reduced time and complements existing safety infrastructure in a continued effort to keep fishers safe in Albany,” Dr Rowland said. The ongoing commitment from Albany’s Department of Parks and Wildlife, local Police, Albany Sea Rescue, Department of Fisheries, Albany Offshore Boating and Fishing Club, the City of Albany, the Life Jacket Loan stores and local volunteers to drive positive change in their local community has been fantastic. To read the Minister’s Media Release click here.